As our elderly always tells us that eat bihon to make our life longer. Do you believed in it? For me, Yes, I believe because this is a healthly food, vegetables is present in here. You can even substitute this to rice and have less carbohydrated content, that’s why its healthy. Is easy to cook and cheap also. Here’s the recipe. Saute garlic, onion, and meat in a saucepan. Add the vegetables and simmer with the broth. Season with soy sauce and pepper. Add noodles and cook until dry. Serve with green onions, sliced egg, with patis and lemon. I add other vegetables, depending on availability. I also soak the dry noodles in hot water before adding into the vegetable and broth mix. 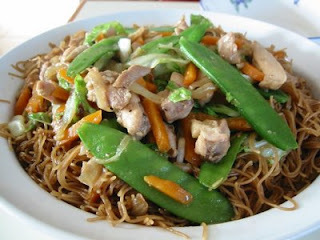 Nice Pancit Bihon. Did you cook it? Anyway, i'll add you in my blogroll too. have a good day!